Types of Roofing Systems that can meet your energy efficient Goals. Home/News/Types of Roofing Systems that can meet your energy efficient Goals. Vanguard has several styles of roofing systems for your commercial or industrial facility. Depending upon the slope of your roof, your budget, and your energy efficiency goals, you may find that one type of roofing is more appropriate than another. Here is an overview of some of the most common types of commercial roofing systems to give you an idea of what is available to you. A traditional commercial roofing system, built-up roofing (BUR) typically consists of several layers of felt adhered together with asphalt, or bitumen. These felt layers are typically pre-saturated with bitumen and then adhered in place during installation with additional heated asphalt. The layers of this material are built-up in layers, giving it additional durability with every ply that is installed. Modified bitumen has been in use as a roofing material for decades and is especially popular in commercial roofing systems. The name comes from the fact that the bitumen is modified with added polymers that give it rubberlike properties. This helps modified bitumen roofing systems act more like a rubberized or polymer roofing system while retaining the benefits of asphalt. 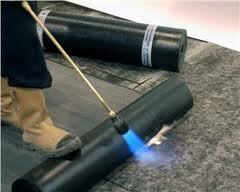 While these systems can consist of multiple plies, modified bitumen can also be used as a single-ply system. These systems are often economical and can help lower overhead costs. 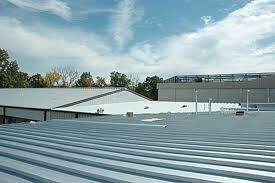 Metal roofing is one of the most durable forms of commercial roofing available today. In fact, even the lowest-end metal roof can last up to 30 years. If you want to make investment in your company’s roofing, consider a high-quality metal roof. Vanguard was established in 1972 as a built-up roof maintenance contracting company and have been in the commercial, industrial, and institutional roofing business for over 40 years with an excellent reputation and a proven track record of satisfied customers. Contact Vanguard to help you decide which roofing system would work best to meet your goals in energy efficiency within your budget. We take pride in our ability to make accurate recommendations, quickly respond to customer’s needs, perform quality work, and we always stand behind our finished product.